We're not going to name names, but the other day, a foreign makeup artist confessed that when he comes to the States, he loads up on eos lip balm. He's not buying two or three of the little balm-filled spheres, either — we're talking dozens. "All of the makeup artists in London beg me to bring them back," he explained. So, what is it about these balms that inspires the sort of collect-em-all compulsion not seen since the height of Pokemon mania? Well, the green-minded crew appreciates the fact that they're free of parabens and petrolatum (and 95% organic, too). Makeup pros like the natural ingredients — shea butter, jojoba oil, and olive oil among them — that keep lips smooth and soft. As for us, we're partial to the packaging: a brightly colored, recyclable little orb with balm inside. (Doesn't hurt that these balms are ridiculously affordable, either.) And, now that spring is so close we can almost smell it, there's a limited-edition passion fruit variety that is blowing our minds. It's part of a two-pack for spring — which has us playing the "one for me, one for you" game already. 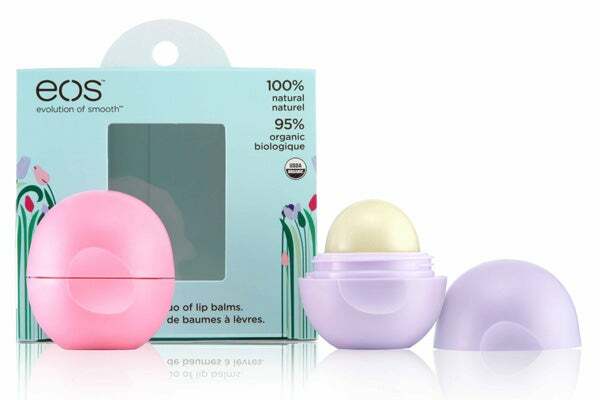 eos lip balm set, $5.98, available at Drugstore.com.